It had rained for weeks. The fields of east Suffolk had dissolved under the onslaught, the River Deben had overflowed its lazy winding banks, and even the country lanes were succumbing to the waters of the flood. I was grateful that my new bike had mudguards, otherwise I would have been as wet as the road. As it was, the rain was beginning to drizzle again as I headed down from Saxmundham. The sky was a leaden grey. Ordinarily I wouldn't have been out exploring churches on a day like this, but the weather had been so utterly awful for the last week that the slight let up today seemed an opportunity to be seized. I turned off the narrow lane onto the track which led to Little Glemham church. As I did so, a car coming from the track braked heavily, and the driver wound down his window. I could see at a glance that they were not locals, probably Londoners, and must have been staying at the holiday cottage along the track. "Which way to the A12?" he asked me desperately. I looked into the back of the car at the faces of three miserable children, the luggage piled up behind them. Beside the driver, his wife gazed at me with a look of anguish. I pointed them in the right direction, and with heartfelt gratitude he sped off towards the main road. I bet they won't be taking a spring holiday in England again. The track I was taking up to the church was actually one of the side entrances to the Glemham Hall estate. Glemham Hall was once the home of the North family, but in 1924 it was bought by newly-weds Sir Ivan and Lady Blanche Cobbold, two of 20th Century Suffolk's great eccentric characters. Blanche Cobbold was born Blanche Cavendish, daughter of the 9th Duke of Devonshire. Her brother's son Andrew Cavendish, the 11th Duke, married Deborah Mitford, one of the Mitford girls, still alive today in her late nineties. Deborah's sister Diana Mitford married Sir Oswald Mosley, leader of the British Union of Fascists, and her sister Unity Mitford was the lover of Adolf Hitler. Hitler himself had met Blanche in the 1930s. She was not impressed by him or by Mosley, or by European fascism in general, but Hitler pronounced her 'charming'. He was probably right. Ivan and Blanche Cobbold married in 1919. Ivan Cobbold was a member of the wealthy Ipswich brewing family, their Cliff House estate overlooking the brewery on Ipswich docks. When Ivan and Blanche bought Glemham Hall, the family sold off Cliff House. It was bought by the Borough, and its grounds became Holywells Park. I sit opposite its main entrance as I write this. The Cobbold brewery, beside the park, had a virtual monopoly of pubs in the Ipswich area. Ivan Cobbold was a sporting man when it came to the horses, but for business reasons he had to forego a race meeting at Newmarket in the early 1930s to attend a football match at Arsenal. He was hooked, and wondered why Ipswich did not have a professional football team. He bankrolled the unknown local amateurs Ipswich Town and persuaded them to go professional with him as chairman. He became known as the Man Who Made The Town. A few short years later in 1936, Ipswich Town Football Club entered the Football League for the first time. Ambitious for success, the Cobbold family appointed the young, untried Alfred Ramsey as manager, and in April 1962, fifty years ago to the day that I visited Little Glemham church, Ipswich Town FC won the Football League Championship, today known as the Premiership, the only East Anglian team ever to win the highest prize in English football. Amongst the tree tops ahead of me a tower appeared like a secret given up, hidden by a cottage and the unresting castles of the elms. This was St Andrew. Uniquely in east Suffolk in 2012, I had to go for a key, and the key is a good mile or so off, in the village close to the A12. But they were very nice about it. The rain began to clear as I cycled back to the church, and St Andrew is a singular church, for one major reason and several little ones. I hadn't been here for about ten years, and so before I went inside I toured the building - I always think of this as a kind of police check, the scene of the crime before it is disrupted by my visit. I remembered doing this here back at the end of the 20th Century, and discovering a guidebook error - the normally impeccable Mortlock reports two crowned lion headstops flanking the west doorway. But one is clearly a woodwose, its club raised to bash out the brains of its companion. Since the crowned lion is a symbol of the risen Christ, one wonders at the theology behind such a juxtaposition. To the north of the church is a most extraordinary extension. It is hard to think of it as a transept - it is nearly as long as the nave itself, and completely windowless. What on earth could it be? Surely not the work of J.P. St Aubyn, who restored this church in the 1850s? 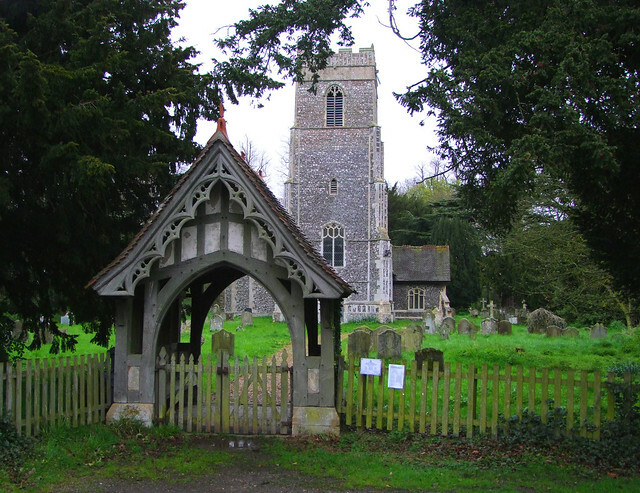 St Aubyn was an architect of some character - you can also find his work nearby at Great Glemham and Sternfield, as well as at Woolverstone and Huntingfield. No, this is grim, oppressive, almost Teutonic, as if Albert Speer had been working in the early years of the 19th century. It looms out towards the Hall, with Hall graves around it. If you don't know what it is, and haven't guessed, then you will shortly find out. St Andrew can be rather a gloomy church to step into, especially on a day like this, but wth the flick of a few switches the inside fills with light. The church is long and narrow, tunnel-like even, but at the east end the chancel is glorious, St Aubyn's vision of an Anglo-catholic heaven perfectly realised. The only jarring note is the massive classical column and archway entrance to the northern extension. You take a few steps, and all is revealed. There, in grim isolation, sits Sir Dudley North MP, who died in 1829. Its not him really, of course, it's his statue. I once described it on BBC Radio Suffolk as the ugliest memorial to be found in any Suffolk church, which resulted in some scorching e-mails from parishioners, I can tell you. It should have a classical gravitas about it, but the overwhelming impression is of a languid bingo-caller, microphone in hand. Two fat ladies, anyone? He was born Dudley Long, and made his fortune by inheriting Glemham Hall from his aunt, Ann Herbert - the story is told on her memorial nearby. The only condition was that he would change his name, and being a Whig of some character and integrity, he agreed, of course. He sits in this vast anteroom with other Glemham and North memorials lining the walls, and space for the living Norths to sit at his feet. Their access to this terrible place is through the door we saw outside. They did not need to meet the ordinary people of the parish on their way to and from church, and they did not even need to see them during divine service. Cautley described the structure as 'a rather dreadful private pew', unwilling to dignify it with the word 'Mausoleum'. North's statue was carved in Rome, but Mortlock reports that the original was lost at sea, and that some contemporaries did not regard the replacement as a good likeness. Perhaps it had been under-insured. In one of those unlikely juxtapositions which occur whenever a building is refurbished continually over hundreds of years, the window to the west of the Mausoleum is by the great Margaret Edith Aldrich Rope. It shows the Blessed Virgin and child with a halo of stars in the middle flanked by two Gospel stories, the summoning of the fishermen and the feeding of the 5000. Mortlock records that the window opposite is by her elder cousin, Margaret Rope, a sequence of the four ages of man, but it is actually by Alfred Fisher for Powell & Sons. Whoever whitewashed the wall above it was rather careless. The carved tympanum depicting Laborare est Orare ('to work is to pray') is the 1907 work of Ellen Rope, another member of that talented family. I think that the pieta on the war memorial is hers too. Above it hangs a fine 18th century decalogue, one of the best of its kind in East Anglia, featuring Moses, Aaron and Joshua above the tablets of the Law. To the south of the sanctuary there is a fascinating medieval survival. At the time of St Aubyn's restoration, a relief representation of the Holy Trinity was set into the wall. It is unlikely to have come from this church originally (St Aubyn had excellent contacts among the London ecclesiastical suppliers) and it is badly mutilated, but the figure of the crucified Christ is clearly discernible. He hangs between the Father's knees, the dove of the Holy Spirit descending above his head. More complete examples can be found at Framlingham and Blythburgh. I stepped outside to find that the sun had briefly made an appearance, so I wandered around the churchyard retaking photographs of the building. I pottered back to the outside of the mausoleum again. The gravestone closest to the door is for Lady Blanche Cobbold, who died in 1987. Her husband had been killed in the London blitz, but In 1965 Lady Blanche Cobbold became the president of Ipswich Town Football Club, a position she would hold until her death. She was the first and, in her lifetime, the only female president of a professional football club. This was at a time when the Cobbold family virtually ran the club. Her sons John and Patrick Cobbold, known to all as Mr John and Mr Patrick, would accompany Alf Ramsey and his successor Bobby Robson on trips to find players, and the Cobbold family had a veto on signings. In the early 1980s, when ITFC fell into the relegation zone, a national newspaper asked Patrick Cobbold if this was a cause for panic. "Of course not", he replied. "We only panic at Ipswich Town when we run out of white wine in the boardroom." Lady Blanche followed Ipswich Town FC through their finest years. In 1978, they won the FA Cup at Wembley, beating Arsenal 1-0, the only East Anglian team ever to win the trophy. A guest of honour that day was the new leader of the Conservative party, one Margaret Thatcher. The Cobbolds were nothing if not Conservative, but the parvenu qualities of the Iron Lady would not have appealed to Lady Blanche any more than those of the vulgar Adolf Hitler had. Anxious to assert the correct and appropriate protocols, an official of the Football Association approached Lady Blanche, and invited her to meet Mrs Thatcher. "Mrs Thatcher?" said Lady Blanche. "You mean - Margaret Thatcher?" The FA official confirmed that they were one and the same. "Good God", replied the grand Old Lady. "Good God. I'd much rather have another Gin and Tonic". She was on the terraces when Ipswich won the UEFA cup in 1982, the only East Anglian team ever to win a European trophy. She died in 1987 with her family still firmly in control of the club, and the brewery still the owner of virtually all the pubs in the Ipswich area. But it was all coming to an end. Margaret Thatcher had become Prime Minister, and her loathing for the aristocracy was almost as great as their loathing for her. Her government ended family breweries' monopoly holds on tied houses. In the resultant scramble for property, the Tolly Cobbold brewery was bought out by Brent Walker in 1989, who promptly closed the brewery down, selling the pubs off at a vast profit to multinational companies and property developers. It was the beginning of the end of the English pub. The Conservative government then orchestrated Rupert Murdoch's Sky TV deal to create the Premiership, introducing fabulous media wealth to English football. In 1994, Patrick Cobbold died, and Ipswich Town FC was bought out by a consortium of businessmen, hungry for some of that money. The club would never win another major trophy, and Ipswich Town now play in the second level of English professional football. Today, Glemham Hall is a venue for weddings and car boot sales.